Okay, I’m back—I'm stuffed full of turkey and mashed potatoes, but nevertheless, back. Occasionally I troll Google News for a beery tidbit to write about. Normally, the stories and articles I come across are plucked from the business sections of newspapers and magazines. Usually they’re about the successes or failures of a brewery, beer brand or pub—stories about everything from beer marketed specifically at women to the rules and regs of beer gardens. They’re usually just the straightforward beery, business practice stuff you’d expect read in every newspaper, in every town, across the globe. Then there are the stories that are not so business-related, but just as beery. Brian Stanley’s two-part article (from November 10 and 24) in the on-line edition of the Joliet (Illinois) Herald-News is one of those stories. The story—in two parts—is a rare, little, gem that combines two of my favorite topics—beer and the Second World War. Stanleys' articles focus on the exploits of Clarence “Clancy” Hess, United States Marine Corps aviator, and later, an American Airlines pilot. A Chicago area native, Hess, was a torpedo-bomber pilot with the 1st Marine Air Wing during WWII. 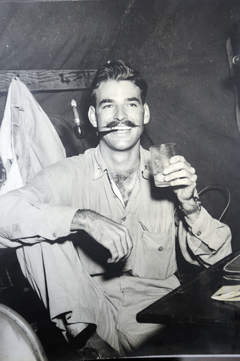 Hess saw combat throughout the Pacific Theater, and was part of the Cactus Air Force ensembled on Guadalcanal during 1942. In 1943, he shot down three Japanese planes over Bougainville, in the northern Solomon Islands. The first article also recalls some of Hess’ adventures as not only a flier, but also as an amateur photographer. While, Hess’ stories of bombing missions and battlefield puppies are interesting, it’s Stanley’s second article that piqued my interest—a story about Hess' last, and perhaps greatest, "mission." By the end of 1944, Hess had been in the PTO for over two years, and by December of that year was stationed at the newly establish naval base at Seeadler Harbor on Manus Island, off the northern coast of New Guinea. Not only being an accomplished combat pilot, but also an aviation barnstormer during the 1930s, helped garner the twenty-three year old Marine a new assignment, as a flight instructor back in Hawaii. However, one last combat mission before heading back to Oahu, would set the stage for Hess’ beery adventure. Hess’ squadron was assigned a mission to strike a bridge being used by the Japanese. As he approached the bridge, Hess deployed his payload, dropping the bombs not over the target, but rather just a few inches from their racks—dumping thousands of pounds of weight onto the aircraft’s bomb doors. Hess returned to Manus, to find his payload undelivered—and what's more—unbelievably nestled on the steel belly doors of his plane. While Hess was lucky the bombs hadn’t detonated, the men of Seeladler naval base were even luckier. They had just been informed that Christmas of 1944 was going to be dry, due to lack of supply, and there was no way any officer was about to order a cargo plane on a 1,200 mile, round-trip flight, just to go pick-up beer. They figured the only way to get beer onto Manus was to put it into a combat aircraft—planes that were small enough to take off and land without drawing any undo attention, but had enough payload capacity to bring back the beer. When Hess and the squadron returned to base, the crewmen realized that their problem had been solved—all thanks to those “stronger-than-they-realized” bomb doors. If those doors could hold the weight of those bombs, they surely could hold a bunch of cases of beer. The base mechanics began stripping Hess’ plane—and his wingman Pat Patton’s plane, as well—of anything “unnecessary” for the “mission”—including the guns and radios—making storage room and shedding weight. In the article, Hess claims he has no idea how far up the chain-of-command the order went, but in late December of 1944, Clancy Hess—along with his friend Pat Patton—flew 600 miles from Manus Island to the Allied air base at Townsville, Australia—and loaded up two, Marine Corps aircraft with 6,000 pounds of beer, booze and cigars. Hess and Patton's planes weighed so much that on the return trip, they barely cleared the white caps over the Coral Sea, and when Hess landed back on Manus, he blew out his tail wheel—a minor sacrifice for the "Greatest Beer Run in History." Needless to say, Christmas of 1944 at Seeadler naval base was not dry. Clancy Hess, at 91, is alive and well living in Lockport, Illinois. Turkey, Football and Beer... But What Beer?